Comedy Bang! Bang! the podcast and Comedy Bang! Bang! the series pretty much exist as two separate, individual entities. As such, it’s easy to consume or evaluate both products (or even just one of them) on their own set of merits. There is the occasional overlap, whether it be recurring podcast characters or even regular “friends of the show” from the podcast appearing up on the TV series in one form our another. For the most part, the only thing that Comedy Bang! Bang! the podcast and Comedy Bang! Bang! the series have in common are the name and the host. But when the two come together in more than just that commonality in name and host, it can be special. 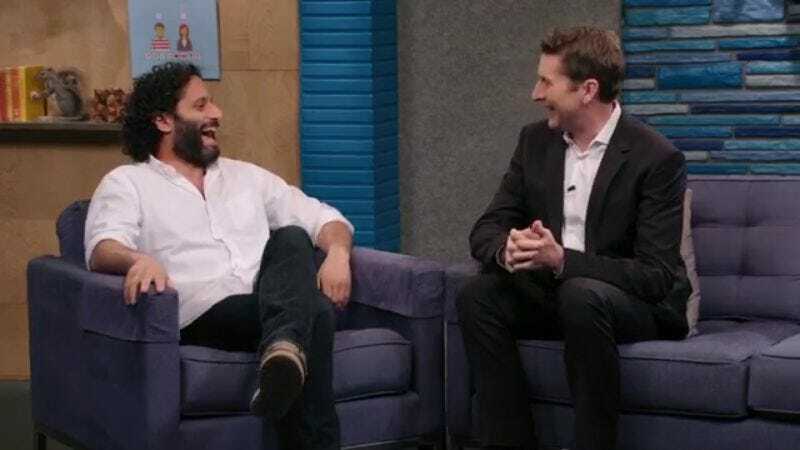 That just so happens to be the case for “Scott Aukerman Wears A Tailored Black Suit,” as long time “friend of the show” Jason Mantzoukas makes good on his podcast promises to take over as host of Comedy Bang! Bang! in Scott Aukerman’s absence. Of course, even with the podcast origins, the series makes it all its own, including a buried treasure gimmick and absolutely no reference to “The Widow Kulap” (as Scott’s wife in the show is Mavis… and she is the dead one). So those those who aren’t familiar with the podcast backstory, this episode still works because of how well it plays with the shifting dynamics—with Scott in the hot seat and Jason Mantzoukas, who’s only been on the series as Chef Luigi Lugosi, in his hosting position—without changing the feel of the show at all. “Scott Aukerman Wears A Tailored Black Suit” is an episode that’s elevated by a knowledge of the Scott Aukerman/Jason Mantzoukas relationship from the podcast but not completely reliant on said familiarity. Plus, after all these episodes, how could you not want to know how Scott Aukerman juggles work and family or if he ever pulls any pranks on set? Actually, because this is his first time as host, Mantzoukas doesn’t know to ask Scott these questions. You can’t expect a first-timer to know all the intricacies of late-night talk show hosting, after all. —but once he actually gets into the role of understudy and guest host… Well, he doesn’t quite go to “next-level bonkers,” even though the episode score often teases such a turn. While Scott Aukerman as the host is still a character through and through, Jason Mantzoukas is more of a straight man (or at least a more relaxed version of the Jason Mantzoukas character) for once. Sure, he’s not always as willing to play ball as Scott would be in the host position, as he calls out how stupid things like Hunch and “Scott Got” are; but he shows off how capable he is in the role in his interactions with everyone’s “best friend” “Weird Al” Yankovic or even in his mature handling of Scott’s immature handling of the red phone situation (pre-“Scott Got” reveal). The Hunch discussion features Scott attempting to armchair host his way through the interview, but it’s not really needed as Jason Mantzoukas ends up being a mighty fine guest host on his own, even though he has ulterior motives. An episode like this is a reminder of how bittersweet it is that Comedy Bang! Bang! is winding down: As great as it is to have Mantzoukas in the hosting chair and playing with the dynamics of the show, this is unfortunately the only time it’s going to happen. Seeing him play around with Scott as the guest is one thing, but now there’s no possibility of guest host Mantzoukas with a different celebrity guest nor is there a possibility of ever seeing him with a different bandleader. This episode leads to quite a few what ifs, which puts Comedy Bang! Bang! in the conversation with its contemporaries that have also called it a day in the past couple of years (Key And Peele, Kroll Show, Childrens Hospital) with still so much seemingly left in the tank. Basically, this is the rare episode where Scott gets to be as cool as he constantly claims he is, simply because it’s the closest thing to him actually playing himself for once. Meanwhile, this week’s character guest also has the podcast and show unite in the form of Drew Tarver’s “legendary soul singer Donny Gary.” Tarver introduced the Donny Gary character to the world of Comedy Bang! Bang! (having done it at UCB before) during the live tour, after filming it for this this episode. The most elaborate part of the humor of Donny Gary has to be the Barry Gibb-esque suit (with the tag still on), because it’s really a simple gimmick once you get past that. At it’s simplest, Donny Gary’s songs are pretty much based on the type of repetition that makes things like the Paul Rust/Walter White bit from the podcast so funny. But there’s certainly more polish here, thanks to the backing track and the particular “rhythm” of the repetitive song structure. Basically, Donny Gary is the type of character that is so specific to Comedy Bang! Bang! in that it’s difficult to explain what makes him so funny without just letting him do the talking (or singing) for himself. However, as brilliantly simple as the character is, the best part of the Donny Gary act here—and another reason why the bit must be witnessed in this case—is actually “Weird Al” Yankovic’s reaction, as he’s the only one who reacts to the fact that the songs are all the same… and not very good. He doesn’t say anything, but it’s obvious that he, the only musician in the group, realizes what’s happening in front of them is bad. Neither Mantzoukas nor Scott react with anything other than praise for Donny Gary, which isn’t exactly the typical Comedy Bang! Bang! reaction when it comes these character guests (as the celebrity often finds themselves weirded out), so Yankovic’s expressions stick out even more. In this episode, even the most typical Comedy Bang! Bang! routine isn’t that typical. While “Scott Aukerman Wears A Tailored Black Suit” is obviously a very good episode with all of these various ingredients, it’s the tag that instantly makes it a great episode. It’s one thing (and it’s a pretty amazing thing) when you come to the realization that Scott’s passion project trailer is aggressively similar to the Entourage movie teaser trailer—especially if you’re the type of person who remembers the Entourage movie teaser trailer—but it’s another once you realize that this entire episode was all leading up to an Entourage punchline. In theory, everyone should have seen that coming, as Comedy Bang! Bang! going true Hollywood could only mean one thing: Hunch is Queens Boulevard. But then the episode nails the combination of the surprise Slow Joey moment (as Haley Joel Osment starred in the Entourage movie and Comedy Bang! Bang! has confirmed that Slow Joey is Haley Joel Osment) and the subsequent “Oh yeeeah” moment from Scott at the mention of him sleeping with Slow Joey’s “dream girl, Emily Ratajkowski” (who was also in Entourage). Jason’s Onscreen Credit: Hey Nongman. All of the film jargon at the beginning is obvious proof that Scott has made it big time in Hollywood, but the real proof? The red red string he wears around his right wrist. They got him. The Kabbalah celebrities got him. As did the early 2000s, apparently, which is even more of an Entourage tip-off. Scott: “Hang on, man.” Touche. Come on, guys. Be honest. Who is Scott’s favorite Spice Girl? A nice touch: Scott is on the phone with the studio during the return from commercial, which is usually the type of thing that wouldn’t matter. Except he remains on the phone as Mantzoukas welcomes people back, creating an interruption and moving the plot along. Way to fail at being a proper guest, Scott! Why would Mantzoukas invest in Scott’s movie instead of just going off with the gold? Well because it’s something to do with “showbiz,” which Mantzoukas admitted to loving during the “17 Magazine” bit. “Showbusiness or no business?” “Showbiz, baby!” It’s the type of throwaway line that ends up being the key to the whole episode.